RIP Shadow Banking System, Long Live QEx! Flash Points in the "Age of Rage"
Stage 1 Comes to an End! Uncle Sam, You Sly Devil! Is the US Facing a Cash Crunch? Sultans of Swap: Smoking Guns! Sultans of Swap: The Sting! Sultans of Swap: The Getaway! Sultans of Swap: Explaining $605 Trillion in Derivatives! Sultans of Swap: Fearing the Gearing! Sultans of Swap: BP Potentially More Devistating than Lehman! EURO EXPERIMENT : ECB's LTRO Won't Stop Collateral Contagion! EURO EXPERIMENT: German Steel or Schmucks? 8 Financial Fault Lines Appear in the Euro Experiment! INNOVATION: America has a Structural Problem! INNOVATION: What Made America Great is Now Killing Her! America - Innovate or Die! these in our latest research papers Macro Analytics videos! "BEST OF THE WEEK "
20 percent of all families in the United States do not have a single member that is employed. So how in the world can the government claim that the unemployment rate has "dropped" to "6.3 percent"? Well, it all comes down to how you define who is "unemployed". For example, last month the government moved another 988,000 Americans into the "not in the labor force" category. According to the government, at this moment there are 9.75 million Americans that are "unemployed" and there are 92.02 million Americans that are "not in the labor force" for a grand total of 101.77 million working age Americans that do not have a job. 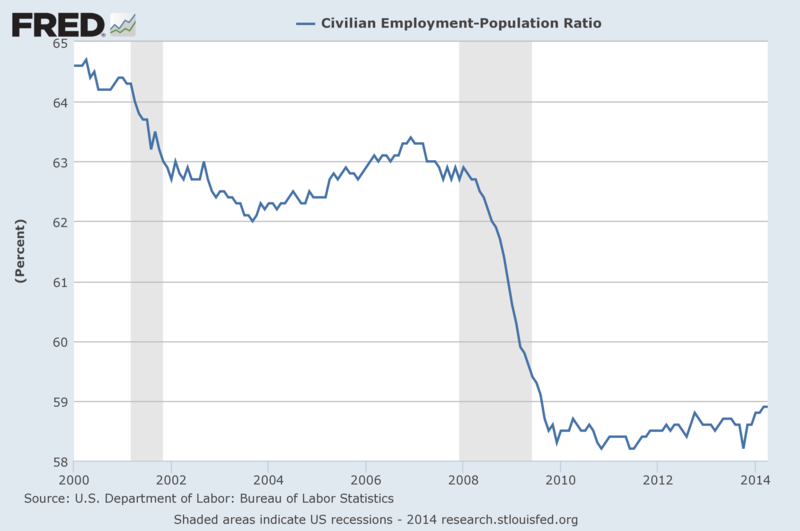 Back in April 2000, only 5.48 million Americans were unemployed and only 69.27 million Americans were "not in the labor force" for a grand total of 74.75 million Americans without a job. That means that the number of working age Americans without a job has risen by 27 million since the year 2000. Any way that you want to slice that, it is bad news. Well, what about as a percentage of the population? Has the percentage of working age Americans that have a job been increasing or decreasing? And the numbers behind this chart also show that employment in America did not increase last month. In March, 58.9 percent of all working age Americans had a job. In April, 58.9 percent of all working age Americans had a job. Things are not getting worse (at least for the moment), but things are also definitely not getting better. The month that Barack Obama entered the White House, we were in the midst of the worst economic downturn since the Great Depression and only 60.6 percent of all working age Americans had a job. Since only 58.9 percent of all working age Americans have a job now, that means that the employment situation in America is still significantly worse than it was the day Barack Obama took office. So don't let anyone fool you with talk of an "employment recovery". It simply is not happening. The official unemployment rate bears so little relation to economic reality at this point that it has essentially become meaningless. Look, how in the world can we have an "unemployment rate" of just "6.3 percent" when 20 percent of all American families do n0t have a single member that is working? A family, as defined by the BLS, is a group of two or more people who live together and who are related by birth, adoption or marriage. In 2013, there were 80,445,000 families in the United States and in 16,127,000—or 20 percent–no one had a job. So if one out of every five families is completely unemployed, then why is the official government unemployment rate not up at Great Depression era levels? Could it be that the government is manipulating the numbers to make them look much better than they actually are? Why don't they just go ahead and get it over with? They can just define every American that is not working as "not in the labor force" and then we can have "0.0 percent unemployment". Then we can all have a giant party and celebrate how wonderful the U.S. economy is. If we were using honest numbers, the official unemployment rate would look a lot scarier. John Williams of shadowstats.com has calculated that the unemployment rate should be about 23 percent. I don't think that is too far off. Meanwhile, the quality of the jobs in our economy continues to go down. The House Ways and Means Committee says that seven out of every eight jobs that have been "added" to the economy under Barack Obama have been part-time jobs. But you can't raise a family or plan a career around a part-time job. To be honest, it is very hard for a single person to even survive on a part-time wage in this economic environment. As the quality of our jobs goes down, so do our incomes. The median household income has declined for five years in a row, and the middle class is falling apart. Without middle class incomes, you can't have a middle class. Considering what we have been watching happen, it should be no surprise that the homeownership rate in the United States has dropped to the lowest level in 19 years or that the number of Americans receiving money from the government each month exceeds the number of full-time workers in the private sector by more than 60 million. For many more statistics like this, please see my previous article entitled "17 Facts To Show To Anyone That Believes That The U.S. Economy Is Just Fine". At a gut level, most Americans understand that things are much worse than they used to be. The Pew Research Center recently asked people what "class" they consider themselves to be. The results were shocking. Back in 2008, only 25 percent of all Americans considered themselves to be "lower middle class" or "poor". Earlier this year, an astounding 40 percent of all Americans chose one of those designations. We are in the midst of a long-term economic decline, and no amount of propaganda is going to change that. But based on the "happy numbers" being trumpeted by the mainstream media, the Federal Reserve is slowly bringing their quantitative easing program to an end. When quantitative easing is finally totally cut off, we shall see how the financial markets and the U.S. economy perform without artificial life support. Personally, I don't think that it is going to be pretty! US 10yr Treasury yields take center stage next week. After 3 months of range trading, they have resumed their year-to-date downtrend. The Friday Bearish Outside Bar (a bearish chart pattern indicating further downside) and closing break of the 2.591% range lows says lower 10yr yields are coming. We target the 2.420%/2.399% multi-year pivot zone and potentially below. DON’T FADE THIS BREAKDOWN. Watch US equities. While the S&P500 is still constructive, small caps and tech remain vulnerable. Indeed, the Russell 2000 is dangerously close to its 200d moving average, a close below which could lead to a bout of risk aversion and be the catalyst for further yield weakness. From an FX perspective, the 10yr yield breakdown threatens our bullish US $ index / bullish $/CHF and bearish €/$ view. HOWEVER, FOR NOW WE ARE STICKING TO OUR GUNS. A break below 79.26 (US $ Index), 0.8699 ($/CHF) and above 1.3967 (€/$) forces us to reassess. In contrast, the yield breakdown increases our n/term bearish conviction on $/¥. The Friday Bearish Outside Bar and close below the 3m range lows say that 10yr yields have returned to a downward trending environment. In the sessions weeks ahead we target the 2.420%/2.399% pivot zone and potentially below. We are becoming increasingly concerned about small cap and tech stocks. Indeed, the Russell 2000 is dangerously close to its 200d (1113). A closing break below would expose 5yr trendline support (1057) and could lead to a bout of near term risk aversion. This is bullish Treasuries. The breakdown in US 10yr yields threatens our bullish US $ Index outlook, as well as our long $/Chf position and topping view in €/$. However, for now we are sticking to our call. A US $ Index break of 79.26 (the Mar-13 low) says our view is misplaced and opens significant US $ index downside. In contrast to our bullish US $ Index view, we remain near term $/¥ bears. Indeed the breakdown in 10yr yields adds to this bearish conviction. In the sessions ahead we look for a test and break of the pivotal 200d (now 101.00), targeting the 99.37 swing target. CORRUPTION & MALFEASANCE -MORAL DECAY - DESPERATION, SHORTAGES. Gordon T Long is not a registered advisor and does not give investment advice. His comments are an expression of opinion only and should not be construed in any manner whatsoever as recommendations to buy or sell a stock, option, future, bond, commodity or any other financial instrument at any time. Of course, he recommends that you consult with a qualified investment advisor, one licensed by appropriate regulatory agencies in your legal jurisdiction, before making any investment decisions, and barring that, we encourage you confirm the facts on your own before making important investment commitments. THE CONTENT OF ALL MATERIALS: SLIDE PRESENTATION AND THEIR ACCOMPANYING RECORDED AUDIO DISCUSSIONS, VIDEO PRESENTATIONS, NARRATED SLIDE PRESENTATIONS AND WEBZINES (hereinafter "The Media") ARE INTENDED FOR EDUCATIONAL PURPOSES ONLY. THERE IS RISK OF LOSS IN TRADING AND INVESTING OF ANY KIND. PAST PERFORMANCE IS NOT INDICATIVE OF FUTURE RESULTS. Gordon emperically recommends that you consult with a qualified investment advisor, one licensed by appropriate regulatory agencies in your legal jurisdiction, before making any investment decisions, and barring that, he encourages you confirm the facts on your own before making important investment commitments. Information herein was obtained from sources which Mr. Long believes reliable, but he does not guarantee its accuracy. None of the information, advertisements, website links, or any opinions expressed constitutes a solicitation of the purchase or sale of any securities or commodities. Please note that Mr. Long may already have invested or may from time to time invest in securities that are discussed or otherwise covered on this website. Mr. Long does not intend to disclose the extent of any current holdings or future transactions with respect to any particular security. You should consider this possibility before investing in any security based upon statements and information contained in any report, post, comment or recommendation you receive from him. FAIR USE NOTICE This site contains copyrighted material the use of which has not always been specifically authorized by the copyright owner. We are making such material available in our efforts to advance understanding of environmental, political, human rights, economic, democracy, scientific, and social justice issues, etc. We believe this constitutes a 'fair use' of any such copyrighted material as provided for in section 107 of the US Copyright Law. In accordance with Title 17 U.S.C. Section 107, the material on this site is distributed without profit to those who have expressed a prior interest in receiving the included information for research and educational purposes. COPYRIGHT © Copyright 2010-2011 Gordon T Long. The information herein was obtained from sources which Mr. Long believes reliable, but he does not guarantee its accuracy. None of the information, advertisements, website links, or any opinions expressed constitutes a solicitation of the purchase or sale of any securities or commodities. Please note that Mr. Long may already have invested or may from time to time invest in securities that are recommended or otherwise covered on this website. Mr. Long does not intend to disclose the extent of any current holdings or future transactions with respect to any particular security. You should consider this possibility before investing in any security based upon statements and information contained in any report, post, comment or recommendation you receive from him.